In a saucepan, heat the oil over medium, then add the onions. Cook for 4 minute or until translucent. Add the cayenne pepper, garlic, and carrots. Continue cooking for 5 minutes, stirring often. Add the vegetable stock, powdered ginger, and orange juice and bring the mix to a boil. Then reduce the heat to low, cover, and simmer for 30 minutes. 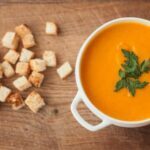 Pour the soup into a blender and process until smooth. Then pour it back into the saucepan and heat.